Many nephrotoxic effects of drugs have been described, whereas the effect on renal development has received less attention. Nephrogenesis ceases at approximately 36 weeks of gestation, indicating that drugs administered to pregnant women and to preterm-born neonates may influence kidney development. Such an effect on renal development may lead to a wide spectrum of renal malformations (congenital anomalies of the kidney and urinary tract [CAKUT]), ranging from renal agenesis to a reduced nephron number. Any of these anomalies may have long-term sequelae, and CAKUT is the primary cause for renal replacement therapy in childhood. This review focuses on research into the effect of drug treatment during active nephrogenesis during pregnancy and in preterm-born infants. Because the effects of many widely used drugs have not been unraveled thus far, more research is needed to study the effect on renal development and long-term renal sequelae after drug treatment during nephrogenesis. The kidney is vulnerable to toxic effects of many drugs, as recently reviewed by Perazella in this journal (1). However, drug treatment can also have an effect on the development of the kidney. Because nephrogenesis ceases at approximately 36 weeks gestation in humans (2), most developmental nephrotoxic effects can be expected during treatment of pregnant women. In addition, premature-born neonates are exposed to extrauterine life before completion of nephrogenesis, and many of them will be treated with drugs during active renal development. In this review, we focus on the prenatal and postnatal effects of drug treatment on the developing kidney. Nephrogenesis is the highly complex process that leads to the formation of nephrons, the functioning units of the kidney (2). The ureteric bud reciprocally induces the metanephric mesenchyme, which leads to condensation of the mesenchyme. Via branching morphogenesis and several stages of immature nephrons (comma- and S-shaped bodies), mature nephrons with a fully developed and elongated tubular system are formed. This process starts at approximately the 5th week and ceases at approximately the 36th week of gestation in humans (2), around which time approximately 1 million nephrons per kidney are present, with a very wide interindividual range of approximately 250,000 to 2000,000 nephrons per kidney (3,4). After term birth, no new nephrons are formed: Growth of the kidney to adult size is solely based on hypertrophia. However, it has been consistently shown that intrauterine growth restriction leads to a reduced number of nephrons (5). There are data suggesting that premature birth (i.e., before completion of nephrogenesis) is also associated with a reduced nephron endowment (6,7). This may be due to extrauterine growth restriction, which is very common in premature infants (8) and which we have shown to lead to a reduced nephron number in an animal model (9). However, nephrotoxic medications used during the postnatal period in premature infants may also affect final nephron number. The rate of premature birth (i.e., before 37 weeks of gestation and therefore before completion of nephrogenesis) varies widely, with approximately 7.9% of all births in The Netherlands (10) and approximately 12.5% in the United States (11), illustrating the many neonates that enter extrauterine life during active nephrogenesis. Maldevelopment of the kidney and/or the urinary tract can present in many forms (for a review, see 12). Easily recognizable malformations can be detected during (routine) prenatal or postnatal ultrasound screening and include renal agenesis or aplasia (unilateral or bilateral) and multicystic dysplastic kidney. Other frequently found abnormalities in the urinary tract may present as a dilated renal pelvis and/or ureter, which may be based on urine flow obstruction (e.g., pelvic-ureter junction obstruction or posterior urethral valves). In contrast, renal dysplasia and hypoplasia are entities that may be more difficult to identify in vivo, but they do involve long-term risks. By definition, hypoplastic kidneys contain a reduced number of nephrons that are otherwise normally developed (12). Unfortunately, the number of nephrons cannot be determined in vivo thus far. As a surrogate marker, renal size is used, which has shown some correlation with nephron number (3). However, renal size cannot be used to predict an individual's nephron endowment and is therefore unsuitable for risk stratification. The normal range of nephron number varies almost tenfold, but a twofold difference has been described to be highly relevant: Keller et al. have shown that a 50% reduction in nephron numbers (approximately 700,000 versus 1400,000 in hypertensive and normotensive individuals, respectively) is associated with hypertension, although kidney weight was similar (13). This shows that even in “normal-sized” kidneys, nephron numbers may vary widely as do the risks at long-term sequelae such as hypertension. Finally, renal development may be altered without any obvious structural aberrations (e.g., by altered expression of [tubular] transporters). An important example in the light of drug effects is renal tubular dysgenesis (14). This is characterized by kidneys of normal size and appearance on ultrasound, but without any urine production or clearance. Renal biopsy shows the absence of proximal tubules, which can be explained by abnormal renal development due to underlying mutations in the renin-angiotensin system (RAS) or by drugs blocking the RAS. Although such congenital anomalies may be difficult to diagnose, they are important to acknowledge because they form the main cause of ESRD in children (15). Two main, distinct categories of drugs can be expected to influence renal development. First, drugs with known nephrotoxic effects in mature kidneys (1) may also have toxic effects on development. Second, drugs that are not nephrotoxic in fully developed kidneys may disturb the fine balance of growth factors that are essential for renal development. Unfortunately, information on either toxic effect is lacking for many drugs, which may lead to the use of drugs that are potentially unsafe and avoidance of drugs that may be considered safe. Here, we will present a brief overview on maldevelopment of the kidney and focus on drugs that have been shown or hypothesized on the basis of clinical, fundamental, or experimental research to be of influence on kidney development (Table 1). Three categories will be discussed: aminoglycosides, calcineurin inhibitors, and prostaglandin synthetase inhibitors. In The Netherlands, 62% of neonates born before 32 weeks gestation are treated with aminoglycosides, as are 26% of neonates born before 37 weeks of gestation (10). However, gentamicin and other aminoglycosides are well known nephrotoxic drugs that can lead to tubular alterations. Similar alterations are found in the offspring of pregnant rats treated with an aminoglycoside (16). Such offspring have also been shown to have a lower nephron number and develop subsequent glomerulosclerosis with aging (17–19). In line with these findings, it has been shown that organ culture of early metanephroi in media supplemented with gentamicin also leads to impaired nephron formation (20). Most newborn rats and mice are at an early stage of kidney development, with only approximately 20% of mature nephrons present at birth and ongoing nephrogenesis until 7 to 10 days of age. Neonatal rats and mice are therefore comparable to premature-born humans regarding the stage of kidney development (Figure 1) and provide a suitable model to study the effects of drugs on (postnatal) nephrogenesis. Treating neonatal rats with aminoglycosides during this postnatal nephrogenesis has also been shown to lead to a reduced nephron endowment (19) and tubular damage (21). However, these drugs are still commonly used in premature neonates for the treatment of (suspected) infections and a large proportion of premature infants receive aminoglycosides during active nephrogenesis. Indeed, most neonatal intensive care units in The Netherlands have a first-line treatment for (suspected) sepsis that includes administration of an aminoglycoside (gentamicin or amikacin), whereas clinical relevant alternatives are available that may have less effect on renal development, such as cephalosporines and carbapenems. 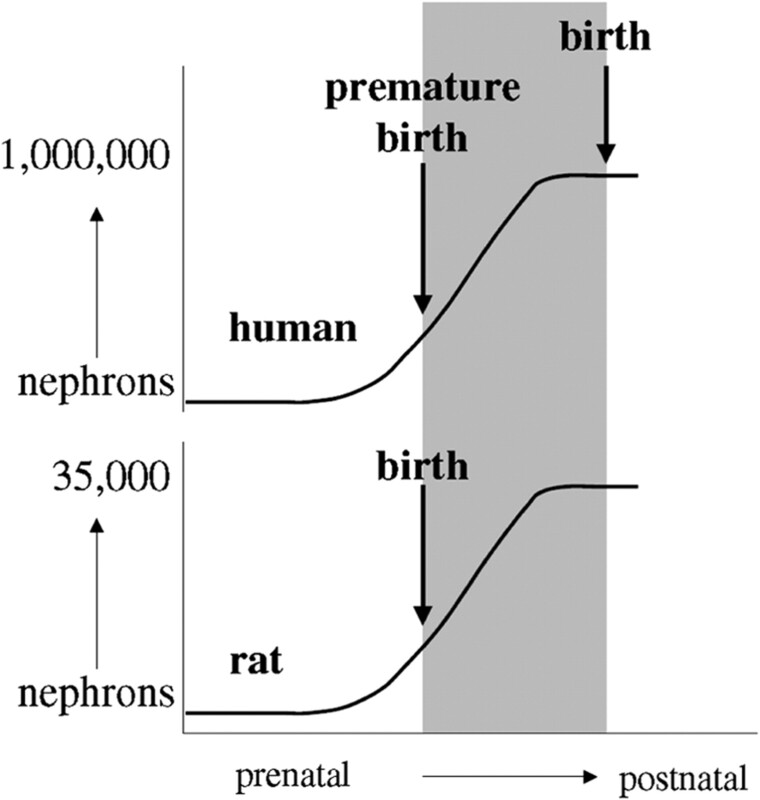 Schematic representation of the timing of nephrogenesis in relation to normal birth in humans and rats. Second, a potentially nephrotoxic compound is the calcineurin inhibitor cyclosporin A. This is a lipophilic immunosuppressive drug and passes through the placenta to the fetus. After treatment of pregnant rabbits with cyclosporin A, the offspring were shown to have a reduced nephron number (22) with systemic hypertension and progressive chronic renal insufficiency in adulthood (23). In mice deficient in calcineurin in the developing urinary tract, a defective peristalsis of the pyelo-ureteral junction is described (24). Pelvic-ureter junction obstruction could therefore be expected in children from mothers treated with calcineurin inhibitors during pregnancy (e.g., after renal transplantation), but clinical data have not been produced so far that substantiate this hypothesis. A final example of nephrotoxic agents are the prostaglandin synthetase inhibitors (e.g., indomethacin and ibuprofen) that are used to treat a persistent patent ductus arteriosus, a frequently diagnosed condition in premature infants (11). On the basis of data from The Netherlands Perinatal Registry, approximately 1 in every 6 neonates born before 32 weeks of gestation is treated for a patent ductus arteriosus. These drugs inhibit the (renal) cyclooxygenase system, and a well known side effect of treatment in premature neonates is anuria or oliguria during the course of treatment, which occurs less often during treatment with ibuprofen (25). Because a normal-functioning cyclooxygenase system is essential for nephrogenesis, it can be expected that these drugs not only influence short-term renal function, but also impair nephron formation (21,26,27). Indeed, harmful renal effects have been shown of acetylsalicyclic acid, another prostaglandin synthetase inhibitor (28). First, an adequate-functioning RAS is essential for normal renal development (29,30). Drugs interfering with this system (e.g., angiotensin converting enzyme inhibitors [ACEIs] or angiotensin receptor blockers [ARBs]) can therefore be expected to alter nephrogenesis and indeed have been shown to do so (ACEI/ARB fetopathy) (31). Genetic knockout mice of the angiotensin II type 1 receptor or angiotensinogen have both resulted in an atrophic renal papilla (29), underlining the role of the RAS in renal development. Several clinical and frequently lethal sequelae have been described of RAS blocking during development, including renal insufficiency, oligohydramnion with hypoplastic lungs and respiratory insufficiency, and limb contractures (14). Kidney analysis of neonatal ACEI- or ARB-treated rats confirms the atrophy of the renal papilla together with tubular alterations such as fibrosis, atrophy, and urinary concentration impairment (32), but it also shows a reduction in nephron numbers (33). Second, steroids are often prescribed to pregnant women with premature contractions to accelerate fetal lung maturation (34). However, maternal treatment with dexamethasone during pregnancy has also been shown to program kidney development (5,35) and has an effect on renal tubular transporters (36,37). This has resulted in a widely used model in the study for the developmental origins of health and disease (5). However, a recent study in monkeys showed no effect of prenatal dexamethasone exposure on nephron numbers (38), which underlines the need for human data to define the effect of steroid treatment during nephrogenesis on the kidney. Third, furosemide is a frequently used diuretic in premature neonates, although chronic treatment of neonates has shifted toward other diuretics because furosemide increases hypercalciuria and is associated with nephrocalcinosis (39). Rats born after maternal treatment with the diuretic furosemide during pregnancy showed a renal concentrating defect that persisted after cessation of nephrogenesis (40). This may indicate that a different expression pattern of renal sodium transporters is induced by furosemide during nephrogenesis. However, furosemide has also been shown to reduce nephron formation in organ culture (41). This may be mediated by alterations in Pax2 expression (42), a highly important factor in kidney development. Fourth, antiepileptic drugs during pregnancy are known teratogens (43) and have been described to increase the risk of congenital malformations in general and of multicystic dysplastic kidney specifically (44). This may be due to increased levels of the B cell lymphoma 2 protein, leading to defective apoptosis and thereby defective nephrogenesis (44). A final but important drug class includes immunosuppressive agents other than calcineurin inhibitors. Such agents have also been shown to have an effect on renal development, especially mycophenolate mofetil (45,46). The pathways involved have not been clarified thus far, but a recent study has identified two factors involved: PDGF-B, potently inducing proliferation, and early growth response gene-1, a transcription factor (47). Other immunomodulatory drugs that have also been shown to influence renal development include adriamycin (48) and cyclophosphamide (49). A wide range of drugs is administered to pregnant women and preterm neonates while renal development is ongoing. Highly prevalent diseases worldwide, such as HIV and malaria, require long-term treatments and bear the risk of renal maldevelopment. HIV and malaria infections during pregnancy are associated with intrauterine growth restriction, which in itself leads to a reduced nephron endowment (5). The effect of such drugs on nephrogenesis is thus far not fully clear. Antiretroviral drugs have been associated with nephropathy in children (50), which illustrates a possible influence on renal development. Of course, these side effects must be put in perspective with the obvious benefits that are obtained by the use of such medications. Information on possible nephrotoxic effects should not be obtained or used to rule out the usage of certain drugs, but it may be used to arrive at treatment schemes for pregnant women and newborns that provide an optimal balance between beneficial drug effects and toxicity. Many drugs have been tested during (fetal) development and have been described or considered to be safe. However, the spectrum of congenital anomalies of the kidney and urinary tract is very broad (12). Specifically, hypoplasia is a difficult diagnosis because nephron number estimation is hardly performed and renal size is only a crude marker. That implicates that no drug, as far as we are aware, has been proven to be definitively safe to use during kidney development. As the long-term effects of low nephron endowment become more and more clear (51), it is highly important to study the effect of drugs on renal development. There are many modifying effects of environmental insults, such as prematurity and intrauterine growth restriction (5,51); therefore, combinations of several drugs and/or factors to study the interactions should also be included in future research. In conclusion, many renal toxic effects of drugs have been described, whereas the effect on renal development has received less attention. However, because renal maldevelopment may lead to congenital anomalies of the kidney and urinary tract, including a reduced nephron number, long-term sequelae are likely to occur. This highlights the need for research into the effects of drug treatment during active nephrogenesis during pregnancy and in preterm-born infants. M.F.S. and R.R.B. are supported by a Kolff Junior Postdoctoral Grant from the Dutch Kidney Foundation.